Taber Time! : A winner & weekend update! A winner & weekend update! Happy Monday! Warning this is a longer post! First, I want to say a huge thank you to everyone who entered the giveaway! I am so happy to have found so many new friends and followers from this. I do plan on responding to all your sweet comments soon, things have just been crazy here. I had a blast doing this giveaway, I am definitely going to do this more often. I think my new goal is to do one per month so be sure to come back! That way it will give me time to think of themes and such so I'm not always giving just gift cards. I've already gotten a lot of ideas that I think you all would love! 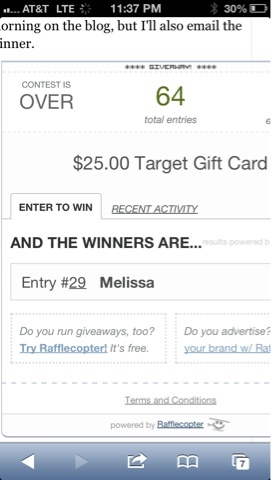 And the winner of my first giveaway is... Melissa! 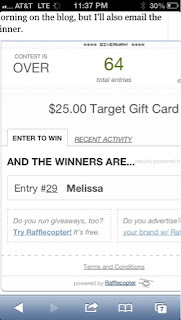 Congratulations Melissa! Now I had a pretty busy weekend that I need to recap. Friday we laid low for the most part. We went out to dinner and then home and watched TV. We were supposed to see a band at this bar we like but the band we were hoping to see had to reschedule which worked out well since I had to be up early Saturday. I got up bright and early Saturday pepped up for my 10 mile run, but looked outside to find ice! Boo. 2 inches of snow and frozen rain which isn't safe for running uphill and on trails. So I still got to hear an amazing, inspirational guest speaker at the coaching session but wasn't able to do the group run. Our running group brought in a runner who is 66 and has run all 35 of the Robie Creek races so he Gave us running advice and told his amazing running journey I might do a post on his speech later. I am a secret Nerd and hope i can snap a picture with him on race day this year. Instead of running saturday I headed out after the crap melted on Sunday morning and hit 9 miles. I've got a lot of work ahead of me but I can't wait to see what kind of improvements I can make in the next 7 weeks. Running uphill really does impact your time and on top of that the race day weather will be around 80-85 degrees so that's another monster I have to be ready for. I averaged around a 12:30 mile, I'm usually around an 11 minute mile. Not too bad. I am working on slow and steady and letting the route lead me when I run and walk. Really practicing and feeling out the course for when to push it hard and when to walk it out. I know I can finish the race but I hope my training will show me some improvements on race day too. I even got my hubby out for the run too! He will probably train with me sometimes, since he is racing too but he has been a natural runner and his baseline is still really fast without training. The hubs and I hit a few happy hours Saturday evening and then watched movies. Sunday after our run we watched Argo in preparation for the oscars. I'm glad we watched it I really liked that story it was a good movie. I was really happy with the Oscar results this year, my pick django unchained won a few awards and Argo (my second choice) won some too! I felt like all of the winners were the right ones for that category. Now I am ready to crash but its only Monday!! Ugh. I've got a lot of work ahead of me this week but I can't wait to get to it! I'm looking into a "runners diet" and what the options are so I think me and the hubs might try a more training oriented diet. Hope you all have a fabulous Monday!! What did you think of the oscars? How was your weekend? I'm still here, and back with a leg workout!